To get the full enjoyment you need a reliable informative tricks guide for Snapchat. Features and facilities of Snapchat are being updated day by day. But getting the full features will give you the chance to making yourself an advanced Snapchat user. I will help you for how to get more lenses on Snapchat. By unlocking hidden filters & lenses, you can get more filters. Here is the way to taking a unique selfie. Don’t stop your unique ideas! Recently, Uganda Knuckles has been bringing out the new features for selfie filters. Here are some secret tricky ways to simply unclose a few awesome filters and lenses to make and take a unique Snap. 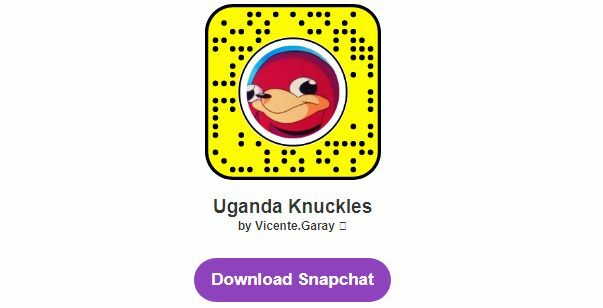 Need Download Snapchat? Click on the link to get its app for free! Snapcode helps you to find out and adding new friends, opening a website etc. To unlock especially hidden features, you can search on the web. I will give you the resources about how to find special Snapcodes in another article within few days. If you need the tips for getting a lot of Snapcodes, please drop a comment about which kinds of codes you need. By the way… It is different to finding some special code to where to found. You may be found at occasionally in various products edition and some websites too! It has a QR code to scan or build with a simple hyperlink. Almost codes may be enclosed by clicking on a webpage link from Snapchat installed phones. I have already described on above about Uganda Knuckles. I think this is the best example of this. Go to this link to unlock new filters. For more example, you can search on the web by writing Snapcata. Clicking a hyperlink will take you to the QR code place. Scan the code with your Snapchat App. And see the real magic! After snapping the QR code, now some new filters and lenses will enclose for you. If you see any kinds of push messages like: “Unlock” or “Unlock for (any time scales)”, just click ok! It can be stared from now. That was the tips to unlock and how to get more lenses on the Snapchat app. Due to the shortage of time, I could not say more today. But if you have any asking about above; Please feel free to ask a question. AppsnChat is with you all the time. So you are not alone 🙂 Thanks a lot.